Fitness and nutrition software for Windows. A comprehensive fitness, nutrition and wellness tracking journal for 1-5 people. This version is specifically designed for Windows computers. Track and analyzie 120 details related to workouts, nutrition, weight loss, diabetes and medical info. It supports cardio. and weight training, accommodates any workout or diet plan, and helps you reach goals. Visualize your progress, judge the effectiveness of diets and workouts, and reach goals sooner too. "The best balance of exercise and nutrition..."
"Weightmania offers a lot bang for your buck..."
"Unbelievably Comprehensive...I am stunned at how much I can track..."
"A great way to start taking control over your health..."
"If you are looking for the cadillac of workout/meal tracking software, you need not look any further..."
• Maximize your diet and workouts, lose or gain weight faster! • When you keep a journal, you're twice as likely to reach your goals. • Motivates you to exercise and eat healthy. • Helps you reach goals sooner. • Makes it easy to stick to any diet or workout routine. • Know if your diet and workouts are effective. • Easily track and visualize progress. • Prevents you from missing and duplicating workouts. • Faster and more accurate than paper logs. • Great for any type of cardio, especially running, walking and cycling. • Record multiple weight training and cardiovascular workouts per day. • Track average, resting and maximum heart rate. • Track the difficulty of each workout and how you felt. • Track weather conditions, routes, injuries and equipment. • Track up to 100 splits per workout. • Create and save predefined workouts (programs); enter future workouts in one mouse-click. • Print weight training programs that you can take to the gym. • Track equipment use (such as mileage on running shoes). • Know when to replace running shoes, bicycle tires and clothing. • Calculates calories burned for hundreds of exercises and activities. • Includes nearly 400 exercises (also let's you add an unlimited number of new ones). • Track daily calories, protein, carbs, fat, sugar, sodium, cholesterol, fiber and water. • Also track servings, food groups and points (for diet plans that use them). • Use drag and drop to enter food fast (drag and drop multiple foods at the same time). • "Favorites list" conveniently stores the foods you eat most often. • Includes 20,000 food database. • Provides 15,000 serving sizes (standard food weights, sizes and portions). • Add an unlimited number of custom foods. • Lookup foods and add their nutrients together (sum nutrients for 100 foods at a time). • Determine the total nutrients in any meal or recipe. • Record and manage an unlimited number of recipes. • Manage and store a grocery list (calculates total cost plus includes section for coupons). • Create predefined meals (menus); in the future, enter meals for an entire day in one click. • Calculates daily calories burned from exercise and BMR (the calories you burn at rest). • Shows daily nutrients broken down by meal (breakfast, lunch, dinner and snacks). • Easily compare daily nutrients to daily goals (includes recommended Daily Values). • Track all the essential measurements including heart rate, body fat and BMI. • Precisely track your body weight. • Track up to 7 body fat caliper measurements. • Copy last recorded measurements to the current day in one click. • Instantly shows you the change between current and last measurements entered. • Track blood pressure and pulse rate. • Track and analyze daily sleep patterns. • Track cholesterol (total, HGL, LDL and triglycerides). • Track blood sugar and medication up to eight times per day (for diabetes). • Print this information and share it with your doctor. • Create line, bar, area, pie and moving average graphs. • Compare data on multiple graphs simultaneously. • Zoom feature lets you enlarge graphs up to ten times. • Create comprehensive reports in text or Web (HTML) format. • Full size color-coded calendar for viewing data by month and year. • Calculates minimums, maximums, averages and totals for all data. • Summarizes information by week and month. • Calculates total weight lifted by muscle group, for any date range. • Calculates maximum weight lifted for each exercise, for any date range. • Calculates mileage, number of uses and use time for equipment (like running shoes). • Counts workouts, courses and routes you ran, days missed, etc. • Filter lets you view specific types of workouts on graphs and charts. • Visually track progress over time. • "Before & after" + daily, weekly & monthly progress photos. • Scanned documents (such as lab test results). • Portraits of each user (when tracking groups). • Charts and screen captures from other applications. • Exercise, recipe, and equipment photos. • Allows multiple photos per day for each user. • Automatically arranges photos in album format. • Add text descriptions below each photo. • Smoothly resize, rotate and print any photo. • Export databases to a single compressed ZIP file that can be e-mailed. • Import one or more databases from a single compressed ZIP file. • Easily share databases between clients and other Weightmania® users. • Share predefined meals (programs), custom food databases and more. • Record data whenever you want (daily entry is not required). • Every field is optional (you don't have to enter everything shown in our sample screens). • Can be customized for each user. • Uses familiar spreadsheets and easy forms. • Supports Metric and English (can be used internationally). • Cut, copy and paste everything (workouts, meals, tables, tabs, text, forms and more). • Paste tables and data directly into other applications like Excel. • Ample space for recording personal diary and daily notes. • Each user can select from five background colors. • Navigate fast with color-coded calendars. • Support for workout and event planning. • Automatically reminds you of planned activities. • Powerful search finds previously entered information fast. • Print any chart, table, report or screen. • Reorder and resize any table column (remembers each user's settings). • Password protection available for each user (keeps your data private). • Built-in, easy to use help system (uses familiar Web page format). • Automatically backs up/restores data (maintains up to 7 previous backups for each user). Instantly find nutrition information for any food with Weightmania's live, interactive search. Results appear as you type. On average, you can find foods in 3 keystrokes. Weightmania's food search is faster than any competing product. As you record food, Weightmania automatically creates a favorites list. Since most people eat the same 20 to 30 foods year-round, in a few days, you'll be able to record everything you eat daily in seconds with drag and drop. Weightmania is the only leading product that lets you drag and drop multiple foods at the same time. You can also create and save groups of predefined meals known as meal programs, menus and templates. These can be used over and over, let you record meals in one-click, or enter meals on future dates as a guide. Weightmania's food database is continuously updated. Along with popular brand names and restaurants, it contains thousands of general foods and serving sizes. You can also add an unlimited number of new (custom) foods, or lookup foods and add their nutrients together. In other words when you can't find a particular food, you can lookup each basic ingredient, sum the nutrients in one click, then save it as a custom food. Over 100 ingredients can be added together at a time. Note: Since there are millions of foods on the market, all fitness and nutrition software requires you to add some custom foods. However since most people eat the same 20 to 30 foods year-round, once Weightmania learns what you eat, you can record meals in seconds using drag and drop. Calendar Displays information and progress by month or for an entire year; squares are color-coded by workout/activity type. Charts Displays information and progress on up to four charts at the same time; provides five types of graphs, data smoothing and a powerful zoom feature. Statistics Displays detailed statistics (minimums, maximums, averages, totals and counts) for any date range; includes every field in the journal; provides an option to show statistics by week. Reports Creates detailed reports using information recorded in the journal; reports can be generated in text or HTML, then saved or printed. Nutrition Finds and displays up to 50 nutrients in any food; searches our large food database and lets you analyze detailed macro and micronutrients. Find Powerful search finds information fast; searches every available field in any date range instantly. For example, find every day in the journal where you ran more than 5 miles, entered specific notes or ate a particular food. Recipe Manager Organize and store an unlimited number of recipes. Stores recipes, directions, preparation time, total time, number of servings, a one to five star rating, detailed nutrition information and digital photos. Arrange, label, rotate, resize and print any image. Print details for one recipe or a complete list of all your recipes. Cut, copy and paste a single recipe or an entire collection. Easily share recipes with other people. Includes 30 predefined categories arranged in alphabetical order. Grocery List Manager Create and store a detailed grocery shopping list. Stores the description, quantity and price for each item. Automatically calculates the total cost anytime you enter, delete or modify an item. Helps you eat better and saves time at the supermarket. Print details for one item or a complete shopping list that you can take to the store. Includes eight predefined categories, including a folder for coupons. Web Link Manager Manage your favorite fitness and health related Web links. Stores the name of each link, a detailed description and its URL. Display any Web page or document in one mouse click. Keeps all your fitness links in one place and stores more detail than most Web browsers. Print details for one link or a complete list of all your links. Easily share links with other people. Training Equipment Manager Track and organize your training equipment. Stores the name of each item, the date it was first used, a detailed description and an unlimited number of digital photos. 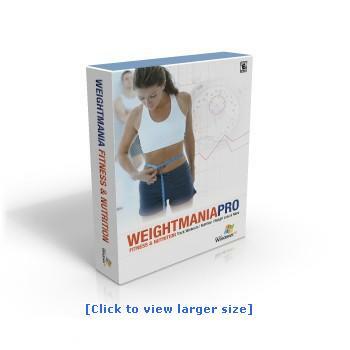 This tool is linked to the Weightmania® journal. By selecting equipment used after each workout, the statistics tool will count the number of times each item was used, calculate minimum, maximum, average and total use time, and calculate the total mileage. It works for any date range. Helps determine when its time to replace running shoes, bicycle tires and clothing. Print details for one item or a complete list of all your equipment. Course/Route Manager Organize your running, cycling, walking and inline skating routes. Stores the name of each course or route, the distance, a detailed description and an unlimited number of digital photos and maps. Arrange, label, rotate, resize and print any image. This tool is linked to the Weightmania® journal. Anytime you record a cardiovascular workout, select the route name from a list to automatically fill in fields and save time (see Input Wizard). Print details for one route or a complete list of all your routes. Body fat Calculates % body fat accurately and fast with no special tools; automatically interprets the result and tells how you rate. BMI Calculates body mass index (a widely accepted measurement of weight status); automatically interprets result and tells how you rate. BMR Calculates basal metabolic rate (the number of calories your body burns while at rest). Calories burned Calculates calories burned for 240 different activities, for any amount of time and body weight. Required daily calories Calculates the number of calories you need daily, based on your age, weight, gender and activity level. Target heart rate Calculates the range your heart rate should be in during cardio. workouts for maximum safety and benefits. Distance, Time, Pace, Speed Calculates distance, time, pace and speed after cardiovascular workouts; can also be used for planning and estimating workouts. Splits Calculates splits for any distance or interval; ideal for race planning or anytime you want to maintain an even pace during training. Math and Conversion 42-key calculator for basic and advanced calculations; performs a wide range of conversions between metric and English. Heart Rate Timer and Calculator Helps you calculate resting heart rate. Heart rate can be used to evaluate your health and fitness level. Includes a large, scientifically accurate 2 minute, 1-minute, 30-second and 15-second count-down timer. Makes it easy to regularly check heart rate at home. One repetition maximum weight Calculates your one-repetition maximum weight ("one rep-max"), and 20 percentages of that weight, for any weight training exercise. This is widely used to measure overall strength and determine how much weight to use in many weight training programs. Target Weight Calculator Calculates the number of calories you need to consume or burn daily to reach a weight goal by a specific date. Helps you lose or gain weight. Enter the amount of weight you want to lose or gain, then select a target date. You can also have it suggest a safe target date based on the weight entered. For increased accuracy, calculations are based on BMR (Basal Metabolic Rate). This is calculated automatically using your age, gender, current weight and activity level. Requirements: 64 MB RAM, 65 MB disk space.